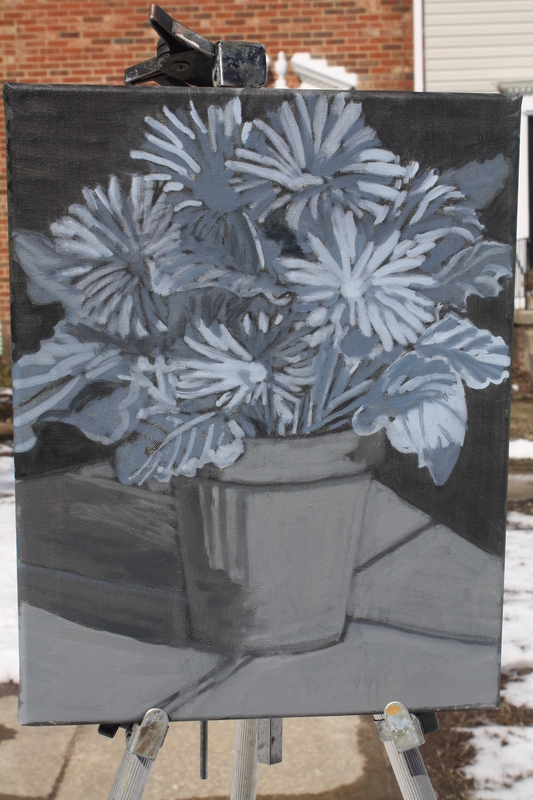 One way to get depth into an oil painting is to do the underpainting in grisaille. (gray) I wanted this one to POP! because I’m getting tired of the dreary weather, so I did my underpainting this way. My orange color would look brighter on a cool gray underpainting and my purple would look cooler on a warm gray underpainting. Grisaille is used in different ways to get different results, but it adds to a 3D effect. I shopped all over town when the weather stayed bad for weeks. 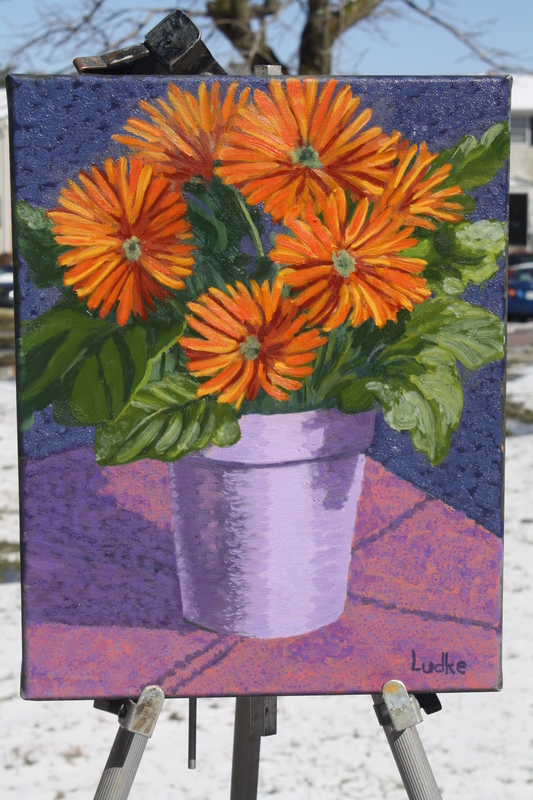 I wanted something bright to do a still life and the artificial flowers looked fake to me. 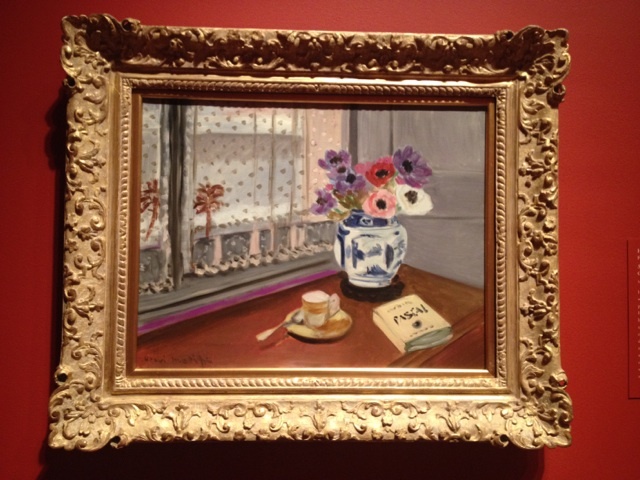 I thought they’d look fake in my painting too, so I was excited when I found this bright flower at Stranges’ in Short Pump! I thought it looked good in the purple pot. 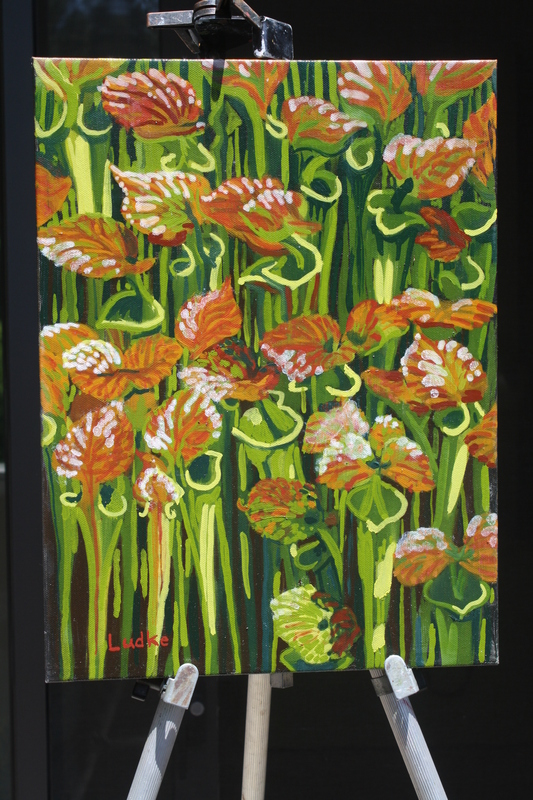 It picked up my mood when I brought it home and worked on this painting on those long dreary days. As I’m hanging around in the Water Garden on different days drawing the pitcher plants, I’m often joined by groups of kids and their teachers. This is what I learned about the pitcher plants. The pitcher plants grow in poor soil. The water dissolves the nutrients in the ground and washes them away. Pitcher plants catch their own fertilizer in the form of bugs. Bugs are attracted to the sweet slightly funky sticky stuff inside the pitcher. When they go in to eat they get stuck and drown in a little sugar water inside the pitcher. As they decompose they feed the plant. The lid shaped leaves don’t go down to close the mouth. The leaves are shaped to run rain water away from the pitcher. The stems are narrow at the bottom and wide at the mouth, so it looks like if the pitcher fills up with water the plant would fall over. Later in the summer a lot of them do fall down. When I get home and look at my drawing I wonder why the teachers don’t talk about the plants crazy personality. Everyone finds these plants fascinating and they don’t know why. This is my explanation. The wide open heart shaped mouths and upturned leaf shaped noses make the plants look like they’re laughing or maybe singing. What are they laughing at? Are bugs tickling their throats? Is it all a bug joke to them? Are they all singing? Is it a frequency beyond the range of human ears? This is the kind of questions I think of. 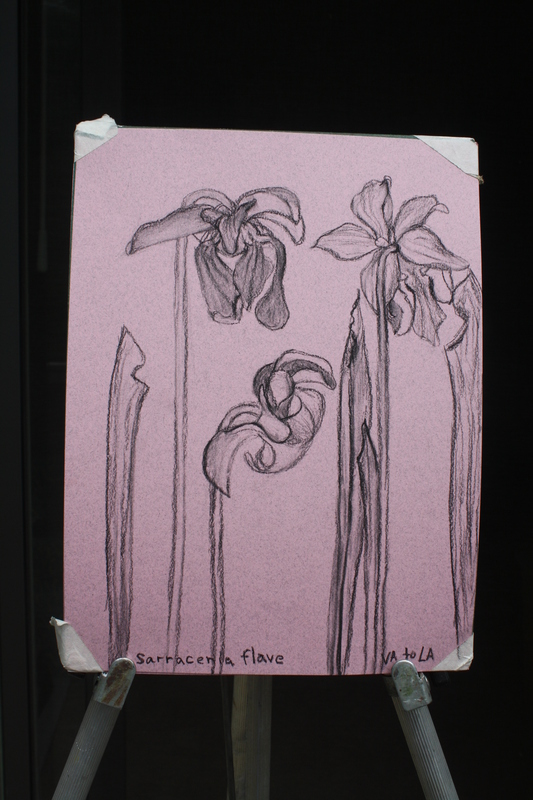 The name of these is Sarracenia Flave. They’re native from Virginia to Louisiana. They’re funny looking flowers, all droopy with heads hanging down. I also drew in some unopened pitchers coming up. I’m working on a painting of Poe’s enchanted garden. It’s almost finished except for the flowers. I was standing on one side of the garden wall to draw the architecture I liked and I noticed the flowers on the other side are blooming. So I have to use my artistic license to move them. The Poe museum is closed on Mon. and rain is coming in. I went to Lewis Ginter Botanical Garden to work on my study. Lewis Ginter is only a mile away from here. 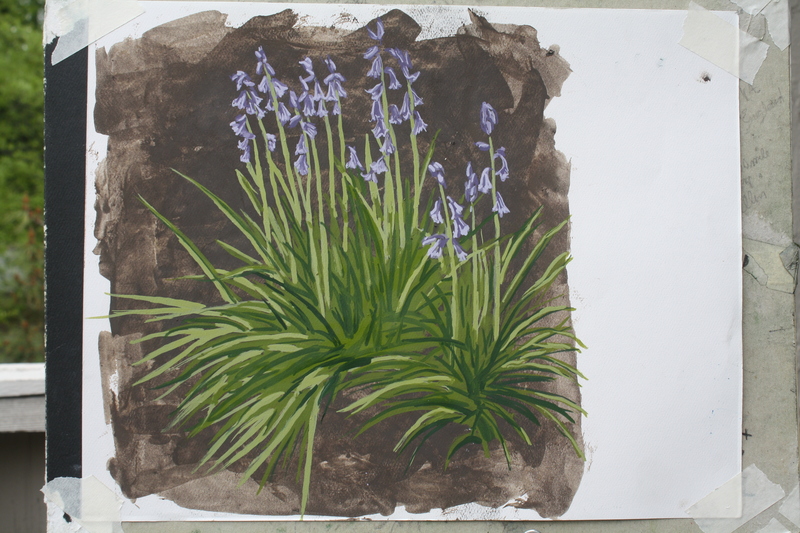 Now that I have the colors I want and an idea how to draw the Bluebells I can finish the painting at home if it rains for a few days. An assignment for my Creative Collage Class was to explore the theme of Nature. Autumn is a time of reflection for me…the changing of the Seasons, the shorter days and longer nights..the brisk nip in the air. The assignment was to incorporate at least one image transfer. I looked through my collection of photocopies and kept coming back to a palmistry hand…palm open with descriptions marked for guidance. But what would be a good match to a hand? I thought about the changing of the Seasons. I thought about how so many cultures celebrate the seasons through the eyes of a Mother Nature Goddess. And that is when I remembered the Greek Goddess Demeter. I started with the hand. The photocopy was transferred to a canvas board. I added Distress Inks to the background using masks and a variety of wax resists. Through the use of stencils…both “home made” and Punchinella…I completed the background with metallic acrylic paint. With the background finished, I added the image of Demeter. 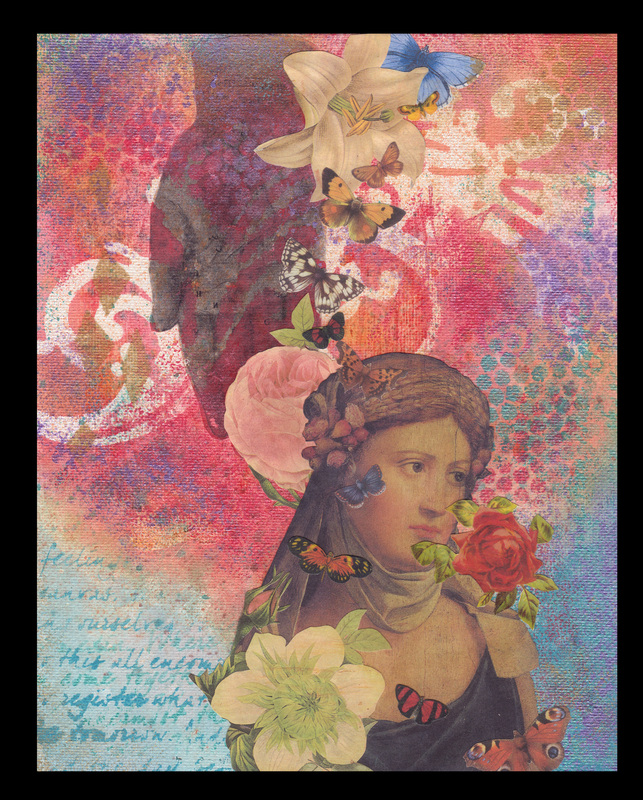 As she is associated with the fertile earth, I surrounded her with flowers and butterflies. I very much enjoyed the project…and finished it during the Full Moon. Goddess, Muse, Spirit…each brings a gift of change and delight for every Season. Is it just my imagination or are these the happiest plants in the garden? 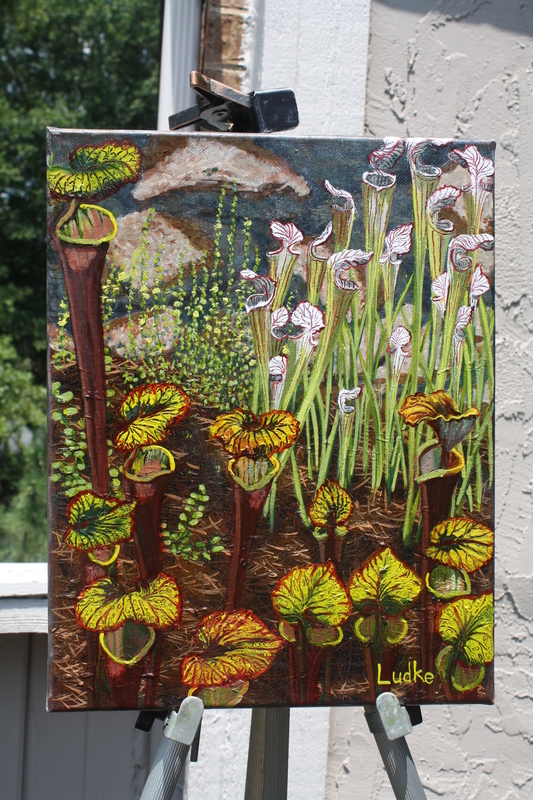 I did the underpainting for the pitcher plants with shades of Alizarin Crimson because the veins in the plants are red. When that dried I put on thick glazes of white and green on top of the red and scratched off lines of wet paint to show the red lines coming through. I also used the scratch through wet paint technique on the pine straw on the ground. This is another way to draw with paint and add texture.